I can't believe it's already December. We were supposed to put up the tree this weekend but never found the time to squeeze it in. Hopefully we can get it done this week, I know Buddy can't wait. I did manage some Christmas crafting during the game last night. We tend to give out a lot of gift cards this time of year, and I always feel a bit sheepish just giving them out in those cardboard holders they provide at the store. So I came up with these felt reindeer pouches sized to fit a standard gift card (sans cardboard holder). I made two different versions one hand-stitched with felt antlers and a quicker machine sewed version with pipe cleaner antlers. I didn't want to have to fiddle with too many little pieces so the ears are part of the back pattern piece. Here's what it looks like from the back. Wanna make one? Here's a pattern with instructions for the hand-stitched version. go bows! and cute card holders! oh man, those are crazy cute reindeer. and go bows!! Those reindeer are adorable! Thanks so much for the pattern. I'm looking forward to trying it! I think undefeated Hawaii deserved the National championship, but we Georgia fans will be glad to take you on in January. Go Dawgs! Meh, I've stopped taking notice of my Alumni's football doings since they droped their "Rainbow Warriors" moniker. I suppose that it also didnt help that when the coach previous to June Jones was in negotiations stayed at the hotel I was working at and skipped out on his bar tab while I was working. I am loving the reindeer pouch though! Totally ganking it for teacher GC's. Myra, those are so cute and you are very generous for offering the pattern here. I recently got the Softies book (the one from Australia) and your patterns in there are just fabulous. Can't wait to start on one. cute card holders and I'm thrilled for our Bows too! What a great thing for Hawai‘i! 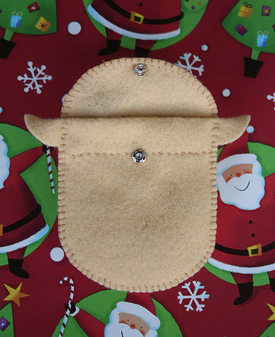 love the reindeer gift pouch, so cute! and yes, go bows!! wasn't it exciting! Myra... wondering if you can do me a favour. We just bought a little car and would like to know how to say "little silver car" in Japanese... can you help me out? que bonitos, me gusta más como queda el primero, cosido a mano, pero los dos son encantadores. I'm not much of a sports fan either, but it's hard not to get into the spirit of things when a local team is on a roll! Those gift card holders are so cute!! Love the reindeer so much. My sewing skills are non existent, but you make me want to try... How do you get their rosy little cheeks??? Is that just blush like you or I would wear, or is it some special crafty stuff that I don't know about??? Thanks so much for the pouch pattern. You ROCK!!!! Congrats to Hawaii on the win. I am not a big football fan but I love to see when a school does so good and makes history! Also thanks for the great idea! I think I have a few gift cards that would love to be tucked inside these little guys. Thanks so much! This pattern is adorable and I know I'll be making some for Christmas! You are awesome. I don't want a gift card but I want a pouch. Yes, yes, yes! Yeah Warriors!! Those card holders are just the cutest, and reminds me that I need to get cracking and start on my stack to be sent out. Happy Wednesday to you! Thanks for sharing the pouch pattern! I think that's a great idea. Those little pouches can be reused as change purses too. Thank you so much for this adorable pattern. I have to buy two gift cards this weekend, and I was agonizing over what to do with them. You have solved my problem! P.S. Congrats Hawaii! I was pulling for them to play in the National Championship game.